The StrongLoop and IBM team attended Node Interactive in Austin, Texas in 2016. While there, we chatted with developers about all sorts of topics about node.js. Because they shared so many great points with us, we’ve shared highlights in short videos. In February we covered: why node matters; the node community; and the importance of open. We wrap up this four-part series with a look at how we can push forward with node.js. Enjoy our “node – pushing forward” video! IBM and Node.js are helping businesses solve their large developer problems with cutting edge applications. As a result, developers may be curious how they can take advantage of this framework. IBM Master Inventors, lead developers and software engineers explain how Node.js and the Node community come together and build stronger applications, APIs and micro-services. 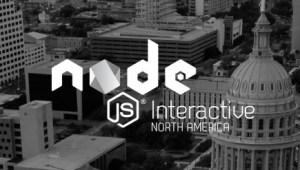 Did you miss out on Node Interactive North America? If you want to know what you missed, check out this event wrap-up by Erin McKean. Spoilers: diversity, open source, swag, Enterprise, and JIFASNIF. Create, run, manage, and secure APIs and microservices with IBM API Connect.